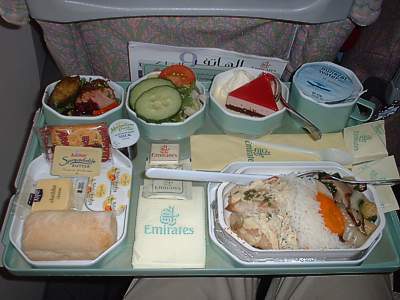 NEWS: Emirates have moved to only offer one meal on flights of less than seven hours, down from the previous meal. This includes flight from the UK, Heathrow and Europe to Dubai. Instead of a large hot meal on takeoff, and a snack on landing, most flights now only have one meal served half way though the flight. This can seriously impact on your sleep on nightflights. Emirates are very much a full service airline, and as such they have a full menu on board, even in economy. 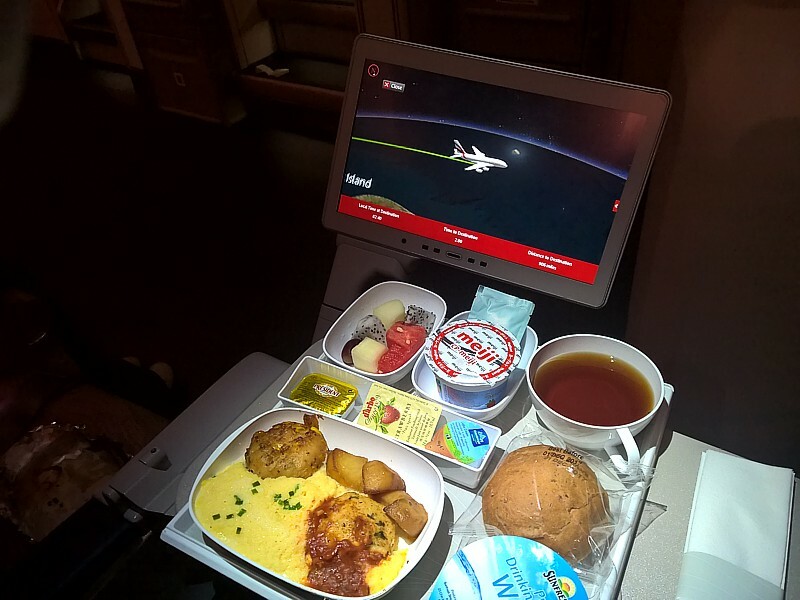 Food on Emirates Airlines alternates between stunning and appauling. 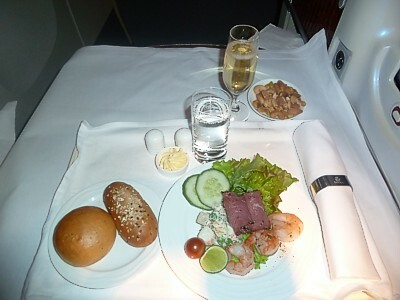 It can either be very good indeed, where even on a short two or three hour flight, you will get a four or five course dinner, or very bad, where in first class you are just fed a small snack and left to fend for yourself. 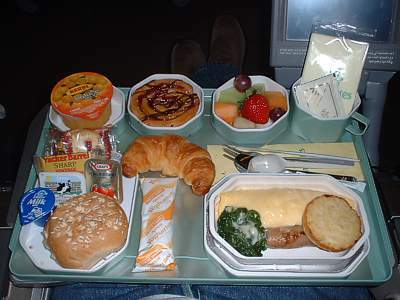 On short flights of 3 or 4 hours, food in Economy is virtually the same as in Business, except Business gets offered 4 dishes instead of the 2 in Economy, and Business serves what is on the economy tray as individual items on crockery instead of just all at once. Very little food value is offered by buying a much more expensive ticket. Plastic knives & forks are used on all flights to LHR. Elsewhere they are metal, including the knives, which look far more lethal than anything that security will take off you. Meal service in the premium classes can be a bit unusual. Menus are sitting on the seat as you board, and then in Business Class before pushback the crew firstly come to Gold card holders, and ask them for their choice, and then they start at the front of the cabin, and the middle of the cabin, and work their way backwards asking for meal choices. If you are at the back of the cabin (or the middle such as row 14 on the A380) - or out of your seat - you can find there is little choice left when they come to you: as a result it's crucial to stay in your seat when the meal orders are being taken. Woe betide you if you change seat - the meal requests can skip you entirely, and then when the meals are delivered an hour into the flight, you can find nothing has been heated for you, and you have to place an order then. 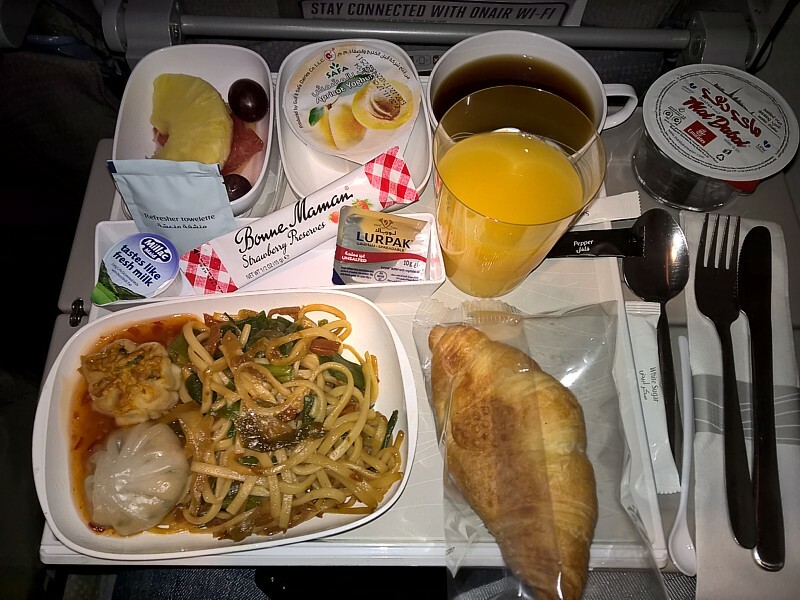 One crucial lesson that is vital to know, espessially if you are flying in the premium classes, is never, ever, to fall asleep before the meal service starts. Emirates crew are trained to never wake up a sleeping passenger for meals. That mean if you are asleep, the meal service will pass you by, and you'll get no food. This can be exceptionally annoying, particularly if you are flying First on a short 4 or 5 hour flight: even if you wake up an hour before landing, the crew will tell you that you are too late for food, and at best will bring you out a small tray of nuts. Because many of the crew are young, and forgetful, even if you tell them that you are going to take a short nap, they may still forget to wake you. The moral is clear - never try to sleep on an Emirates flight if you want to eat. 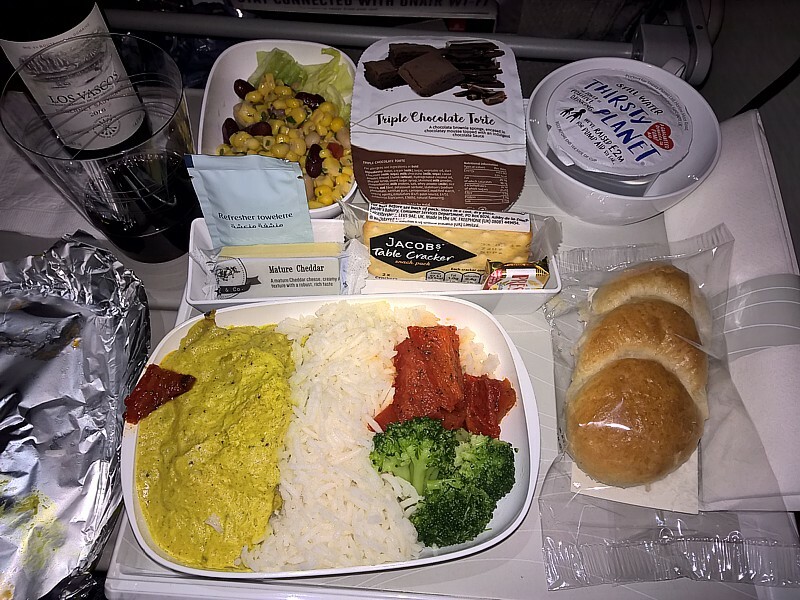 All flights get a tray in economy, and normally a menu with the food options. In business there is a table cloth, and pretty brisk service, particularly on shorter night flight. In First, you can dine when you choose, although most people want to just after takeoff. 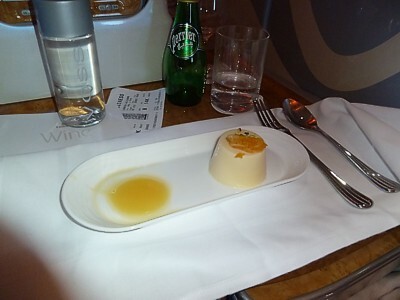 In First Class the food is absolutely superb quality. The quantity is however somewhat lacking. Two slices of beef, three prawns (cold), two slices of cucumber, one slice of lettuce. 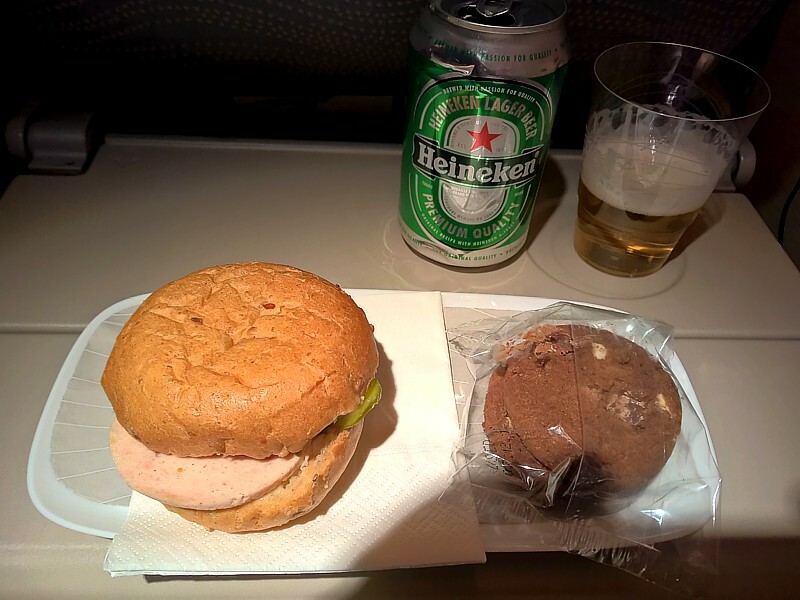 If you imagine that on a short two or three hour flight in First Class you'll get a banquet, think again. In first, sometimes (particularly overnight) you'll end up with just a small snack. Barsnacks in the rear business class bar, with breadsticks, olives, nuts, "Basboosa Sweet" (a traditional Arabic Sweet Cake) and a beef canape. 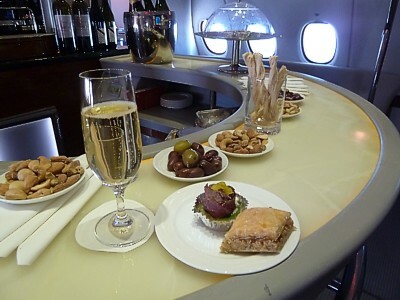 Due to the nasty habit of Emirates refusing to wake up passengers for food, sometimes you'll be left to forage for snacks in the rear bar if you oversleep the meal service. These can actually be quite good, with lots of traditional Arabic desserts and sweet meats, plus the usual olives and breadsticks. Tortellini in Pesto, with tomato sauce and one corgette. Beef salad starter with two slices of beef. Two rolls. Nuts. Butter. Dear or dear. What a sorry mess this is, with congealed pasta, overheated, and fused together. Little quantity or quality: not what you expect from buying a premium ticket. Three slices of chicken, carrots, beans, and rice with raisins. Slightly better, but really offering little more over the economy meal, this really is pretty woeful, and not what you'd expect of Emirates. Lemon tarte. Small pool of lemon curd. Nepalese goat momos with stringy pasta in light sweet chili sauce. Chicken in yoghurt sauce served with steamed basmarti rice, sauteed broccoli and red peppers. Sweetcorn salad. Triple chocolate delice. Scrambled eggs with chives, served with grilled chicken parries, sweetcord fritters and roasted potatoes. Breakfast roll, with butter and preserve. Plain egg omelette topped with grated Gruyere cheese accompanied with creamed spinach, grilled veal sausage and roesti potatoes. Fruitbowl with 2 slices of three different types of mellon, two grapes and a strawberry. Danish pastry, crossant, roll (with seeds) butter and strawberry jam. Orange juice, yoghurt bar, cheese and biscuits. All this for a three hour flight... I mean, you hardly have time to eat it all! And very good it is too. The Omelette is as expected very plain, but comes with a fantastic veal sausage and lovely tender spinach. The fruit bowl is a delight, and the strawberry an unexpected treat. The crossant is soft and light, while the danish speaks for itself in terms of its stickyness. By this point I was a bit lost as to what to do with the roll, let alone the cheese and biscuits. The yoghurt bar is definately something to save for later. 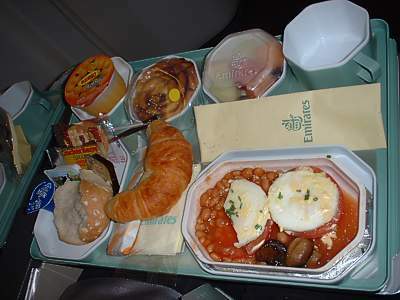 All in all one of the best breakfasts ever served in economy. Poached Eggs topped with Hollandaise sauce, on top of tomatos in a bed of baked beans, served with two sauteed button mushrooms in tomato sauce. Fruitbowl with 3 slices of two different types of mellon, three grapes and a strawberry. Danish pastry, crossant, roll (with seeds) butter and apricot jam. 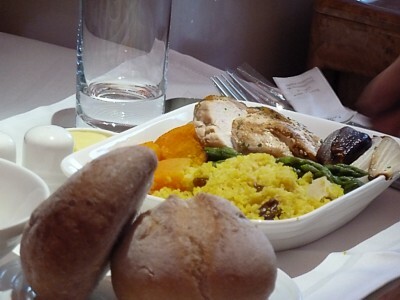 Another incredible meal - at least Emirates are consistant. The poached eggs are a bit solid after having been frozen and heated up, but the sauce still has flavour, and the two mushrooms go down very well. The fruit bowl is very good, with a fresh strawberry even in winter. The crossant is soft and light, while the danish would be enough for breakfast on its own. The roll is a bit dry, and the cheese and biscuits are still confusing. The yoghurt bar is a bit cheap and industrial, but still works. Thai style Chicken Curry with a hint of coconut and lemongrass flavour, garnished with red chillies, accompanied with Chinese mixed vegetables (including miniture sweetcorn and shittake mushrooms) and steamed rice. Salad with lettuce and rocket, two slices of cucumber and one segment of tomato. Salad dressing. Cajun spiced lamb loin appetizer placed on lettuce, accompanied with pan fried green courgettes, dried tomatos and served with beatroot relish. Glazed Raspberry Charlotte garnished with dark chocolate scroll and fresh mint. A small "log" roll with butter. Cheddar Cheese and two Arnott Biscuits. Pot of water. A small Emirates chocolate. Wow, so much food, for such a short three hour flight. The chicken is done just right, with lots of flavour, but has tiny (and very hot) chillies hidden in the rice which will take the top of your head off. An odd choice for an airlinemeal. Lovely mushrooms though. The Lamb appetizer is a good start, with beetroot relish in the Australian style. Lovely sauce for the salad too. But best of all is the desert, which is one of the best served in any airline's economy cabin. Kind of like a cheesecake, it melts in the mouth. Shame about the roll, which is a real disapointment, and after all that the cheese seemed pretty ordinary.